Karina's Kreations: Stampin'Up Baby Bear! The super cute Baby Bear stamp set #141859 is 25% off until Nov 30. 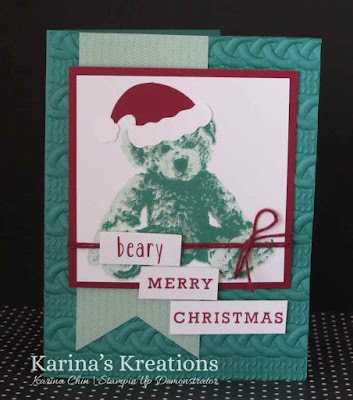 I paired it with the Jolly Hat Builder Punch #141847 and the Greetings From Santa stamp set #143269 (also 25% off) to make this cute card. I have a tip for lining up the Baby Bear stamped image. Start with the image marked #3 on the image sheet and stamp with Emerald Envy ink. Then stamp the #2 image with Mint Macaron ink and line up the eyes. Finally stamp #3 image with Mint Macaron ink but stamp it off once on scrap paper. You should have a perfectly lined up bear image. I also used the Cable Knit Dynamic embossing folder, Baker's Twine Trio Pack#141999 and Presents & Pinecones Designer Series Paper #141986.